People are in a vedio time, we touch these vedioes every day,like computers,cell phones,play game and TV LED displays.That will send out much blue lights for our eyes,then there are increasing dramatical vision problems.So we need a nice anti blue glasses to protect our eyes,safeguard our eyes and reduce digital eyestrain from screen time.Then we can focus on what matters to you,to get a good rest and even have a good sleep when wear them about 15 minutes before go to bed. 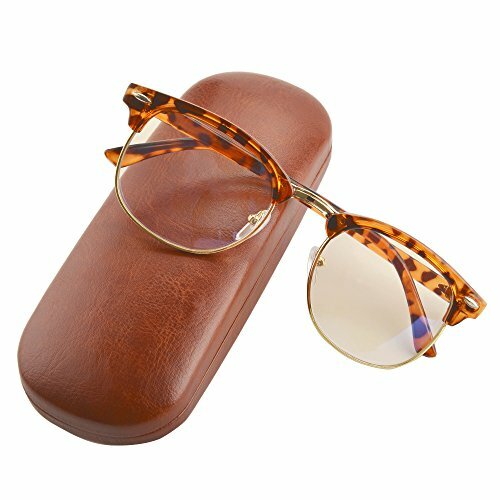 This price is quite worthy for our glasses,since they are high quality metal with plastic,also have a retro fashion style.And it comes a matched hard case,a cleaning cloth. Please keep contact with us if you have any question for this item or the deal you ordered.We are working hard to reply you within 12-36 hours to satisfy you.You should know a nice talking is the beginning and key important to a good transaction.So have a fun and wonderful purchase here. The package comes with an anti blue light glasses,a soft and useful cleaning cloth;A hard matched case,which is customized to safeguard the glasses when delivery or on hand everywhere. Blue light seriously hurts human eyes,especially today is in vedio time.They even effect our sleep.Our glasses could reduce the harm for eyes,to protect the vision from TV,computer,cellphone or other LED displays,and get a better sleep time when wearing about 15 minutes before sleeping. The frame and the temples are mainly plastic.The rim wires and the bridge nose are metal,which is much durable and outstanding style.Also it's 100% UV400 to protect eyes. The material and this design guarantees durability and comfort to wear for a long time.The Lens are yellow with anti blue light.